Many properties in the Bay Area are located on sloped terrain, which can offer increased privacy and stunning views. But it’s hard to create opportunities for outdoor living at a home that’s situated on a steep lot. One solution is to build a hillside deck. There, you can finally have outdoor space to set up the grill, socialize with friends and allow children to play safely outdoors. Building a hillside deck does require significant engineering and construction know-how. To learn more about how hillside decks are built, we got in touch with Thomas Daly, who has been constructing hillside decks for nearly three decades with Thomas A Daly Construction, a Diamond Certified company. Diamond Certified Resource: What makes constructing a hillside deck unique? Thomas Daly: Engineers play a central role in drawing up plans for these decks. They’ll look at the slope of the terrain and examine the soil composition of the lot. There are actually many different soil conditions in Marin County alone, which is where I primarily work. Generally, hillside decks need to be supported by special 18-inch piers that are placed 10 to 15 feet deep in the ground, depending on the engineering requirements. These piers are held upright by specially designed, spiral-shaped steel cages. In addition, the project may call for grade beams, which tie the piers together in a grid pattern and then link back to the home’s foundation. DCR: This sounds complicated. Is it all done to keep the deck stable in the event of an earthquake? TD: It is complicated, and in truth it can be quite expensive depending on the specifics of the terrain. It’s also a process that requires input from many professionals: a soil engineer, a structural engineer, the building contractor and the permitting agency (city or county). We do all this structural work in part to ensure the new deck can withstand seismic events. The piers and grade beams also help keep the deck stable as the terrain shifts in response to the natural soil erosion that will occur year after year. DCR: Is there anything else about hillside deck construction that’s different? TD: Actually, the rest of the construction is straightforward. We use the same type of pressure-treated wood and joists as on regular decks. DCR: What should homeowners look for to determine if an existing hillside deck needs to be repaired or replaced? TD: The signs that a hillside deck needs to be repaired are the same as a regular deck. Homeowners should look for signs of obvious distress on the deck’s substructure. If the posts or joists are starting to get spongy or rotted out, it’s time to replace. 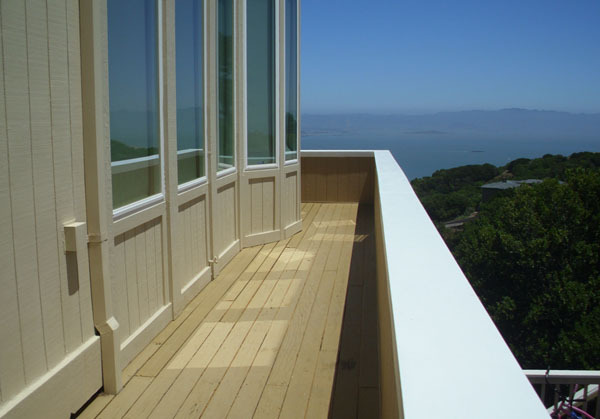 Years ago, decks were constructed with Douglas fir rather than pressure-treated wood. These older decks will last about 20 years, but today’s decks are built to last a lifetime. DCR: If a homeowner wants to build or repair a hillside deck, do they need to find an engineer first or get a deck contractor first? TD: They can go about it either way. We won’t start constructing the deck until engineers have gone over the plans and the project has been granted the proper permits. Sometimes we put clients in touch with the other professionals they’ll need; other times they come to us with preapproved plans. DCR: Are there times of the year that are best/worst for building a hillside deck? TD: Trying to build a hillside deck in the winter can be challenging, as it’s the rainy season in the Bay Area and the time of year when we see the most soil erosion. The deep holes that we drill for the support piers and cages can fill with water if it starts to rain. We then have to bring in pumps to clear the rainwater before we can continue with construction. After heavy rains, the ground is likely to be saturated with water for some time. I’d recommend waiting until the conclusion of the rainy season before building. DCR: Are there any situations where it’s just not feasible to build a hillside deck? TD: I’ve never heard of a situation where they said a deck couldn’t be built. Anything is possible—as long as money isn’t an issue!